Rob, again thank you for the article. I am curious, is there a easy way to feed your system directly from Quandl instead of legacyCSV files? Getting data from quandl python api is very easy. The hard thing is to produce the two kinds of data - stitched prices (although quandl do have this) and aligned individual contracts for carry. So the hard bit at least for futures trading is writing the piece that takes raw individual contracts and produces these two things. 1. i) do you optimise the weights for each trading rule based on each instrument individually, so each trading rule has a different weight depending on the instrument, or ii) do you optimise the weights for trading rules based on pooled data across all instruments? 2. if the answer above is ii) how do you assign the WEIGHTS TO THE INSTRUMENTS when you pool them in the optimisation to determine the WEIGHTS TO THE TRADING RULES? Are the instrument weights determined in a prior optimisation before assigning weights to trading rules? Is your process to first optimise the weights assigned to each instrument, and after this is done you pool the instruments based on these weights to optimise the for the weights for each trading rule? 1. do you calculate the median or arithmetic average? 2. in order to calculate the average, do you personally pool all the instruments, or do you take the average forecast from each instrument individually? Apologies for the caps, could not find any other way to add emphasis. "1. i) do you optimise the weights for each trading rule based on each instrument individually, so each trading rule has a different weight depending on the instrument, or ii) do you optimise the weights for trading rules based on pooled data across all instruments?" Number (ii) but in the presence of different cost levels (code not yet written). "2. if the answer above is ii) how do you assign the WEIGHTS TO THE INSTRUMENTS when you pool them in the optimisation to determine the WEIGHTS TO THE TRADING RULES? Are the instrument weights determined in a prior optimisation before assigning weights to trading rules? Is your process to first optimise the weights assigned to each instrument, and after this is done you pool the instruments based on these weights to optimise the for the weights for each trading rule?" No, if you look at the code it is just stacking all the returns from different instruments. This means they are equally weighted, but actually implicitally higher weights are given to instruments with more data history. 1. do you calculate the median or arithmetic average?" "2. in order to calculate the average, do you personally pool all the instruments, or do you take the average forecast from each instrument individually?" Hi Rob, Thanks for your answer above. I am unclear as to i) when in the process the instrument weights are calculated and ii) how these are calculated. Are you able to explain this? The instrument weights are calculated when they're needed; after combining forecasts (chapter 8) and position scaling (chapters 9 and 10). As to how, it's just portfolio optimisation (of whatever specific kind you prefer; though I use bootstrapping on an expanding out of sample window). The assets in the portfolio are the returns of the trading subsystems, one for each instrument. Sorry Rob, I am still trying to wrap my head around this. So to confirm, the instrument weights are determined in a SEPARATE optimisation that is INDEPENDENT from the optimisation of the weights assigned to trading rules? So two separate optimisations? Yes. The forecast weights optimisation has to be done first; then subsequent to that you do one for the instrument weights. OK, this is clear in my mind now. Thank you! Can you perhaps write a blog post about how the Semi Automated trader could develop scaled forecasts? In the book, the examples of CFD bets (not available to those of us in the US) is very helpful, but what if we like the way in which your signals fluctuate from moderately strong to stronger? The instrument you're trading is irrelevant. 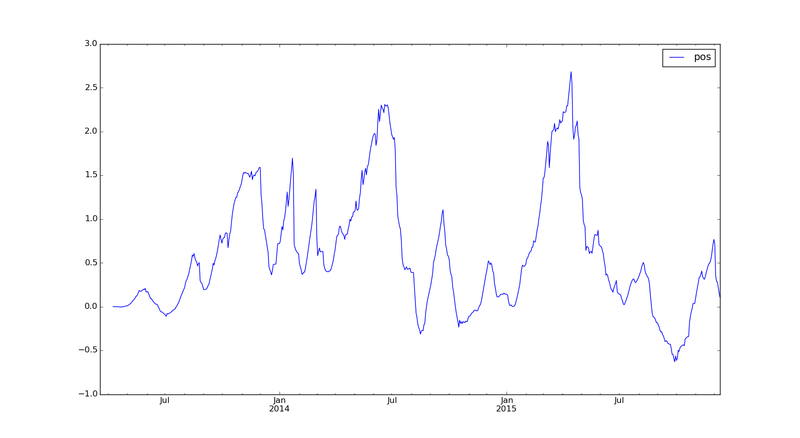 It's just a matter of translating your gut feel into a number between -20 (strong sell) and +20 (strong buy). I'm not sure that's something I can blog about. Or have I misunderstood the question? Right, that makes sense. Perhaps i'm just not fully understanding. Based on the walk-through examples in the book for the Semi-automatic trader using CFD's, the signals aren't combined or anything fancy like that. Like you said, its just a matter of translating gut feel into an integer. I just wanted to know if it were possible for the discretionary trader to develop a weighted combined forecast, similar to the staunch systems trader. One of the most attractive features of your system is the fact that the signal generation is done for you on a routine basis. Based on my limited understanding, it seemed like the semi-automatic trader is limited to explicit stop losses and arbitrary binary trading. Oh sure you can combine discretionary forecasts. If you post your email I'll tell you how (not a secret but a bit long for a comment). I moderate posts so I won't publish the one with your email in it. I've a question about forecast weights. I want to use bootstrapping to determine the forecast weights. I think it's best to calculate separate forecast weights for each element because the cost/instrument can vary substantially per instrument. Also in my opinion it's important to take into account the trading costs for the calculation of the forecast weights, because a fast trading system will generate a lot of trading costs (I work with CFD's) and I think a lower participation in the combined forecast for the faster system will be better. Do you agree with this ideas ? My idea is to calculate a performance curve for each trading rule variation for each instrument and use this performance curves for bootstrapping. Is this the correct way ? Yes definitely use trading costs to calculate weights and if costs vary a lot between instruments then do them seperately. The method you outline is correct. I was listening to Perry Kaufman podcast on Better System trader, and he said that true volatility adjustment doesn't work for stocks. The argument is that because stock has low leverage and if you trading a stock with low volatility you will need to invest a lot of money to bring that volatility to mach other stock and you may not have enough money to do that. Another option is to reduce to position of the other stocks but then you not using all the money. What he suggested is to dividing equal investment by stock price. I wonder that your thoughts on this? Generally speaking I think volatility adjustment works for any asset that has reasonably predictable / continously adjusting volatility. Theres nothing bad about stocks, except maybe illiquid penny rubbish, that makes them bad for vol sizing. 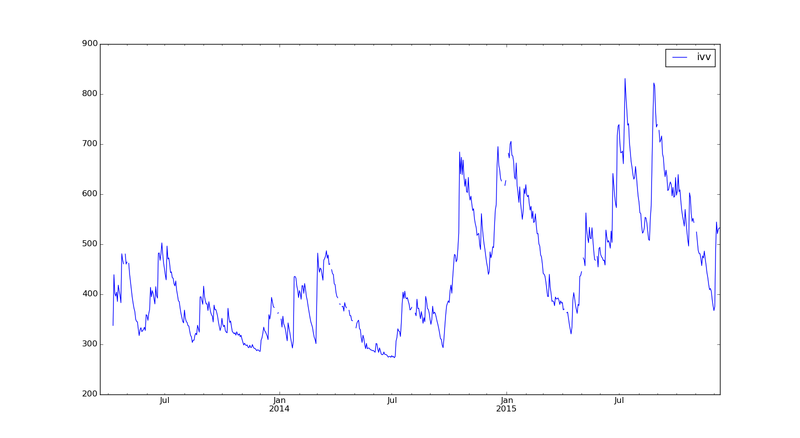 BUT really low volatility is bad in any asset class. I discuss the problems of trading anything with really low volatility in my book. Essentially you should avoid doing it. If you haven't got leverage then as Perry says it will consume too much capital. If you have got leverage then you'll open yourself up to a fat tailed event. It also leads to higher costs. 1.) I may have missed somewhere if you mentioned it, but how do you manage hedging currencies? It seems like your trading in pounds, so for instance how do you hedge contracts denominated in AUD? 2.) What is your margin to equity? This is something I keep hearing about. For instance backtesting a few different strategies and running the margins in CME database shows a margin to equity of about 35% when I am targeting 15% vol. This seems high compared to other managed futures strategies that say about 15% margin to equity and have higher volatility(even while trading more markets than I). Any thoughts would be more than appreciated!! You don't need to hedge futures exposure, just the margin and p&l. My policy is straightforward - to avoid building up excessive balances in any currency. My margin:equity is also around 35%, but on 25% volatility. I agree that your margin sounds rather high. Thank you!! Would you mind providing just a simple example of how the currency hedging works? Also, I'm trading markets similar to yours and I can't see my margin to equity being correct, would you agree? I buy an S&P future@2000. The notional value of the contract is 200x50 = $100K. I need to post $6K margin. I convert say £4K GBP to do this. Scenario a) Suppose that GBPUSD changes such that the rate goes from 1.5 to 2.0. I've lost £1K since my margin is worth only £3K. But I'm not exposed to losses on the full 100K. 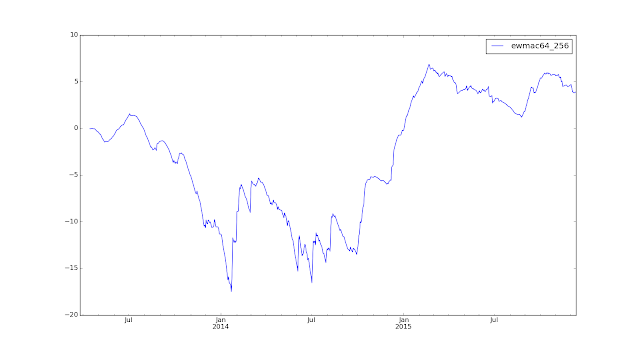 Scenario b) Suppose the future goes to 2200 with the fx rate unchanged. I've made $50 x 200 points = $10,000. I sweep this back home to GBP leaving just the initial margin. I now have $10K in GBP; i.e. £6,666 plus $6K margin. Scenario c) Suppose the future goes to 2200. I've made $10,000. I don't sweep and GBPUSD goes to 2.0. I've now got the equivalent of £5,000 in profits and £3,000 in margin. I've lost £1,666 plus the losses on my margin as in scenario (a). I agree your margin does sound very high. Ahh I see. Thank you very much, very helpful to me! Your response is greatly appreciated. Thank you for your work and love the book! I hope you don't mind questions! You say you have a 10% buffer around the current position(i.e if the weight at rebalance is 50% and the target is 45%, you keep it at 50% because it is within 10%). However, what if you have a situation where the position changes from, say, +5% to -4%? This is within the 10% buffer but the signs have changed, what do you do with your position? Gotcha. So you'd leave it at 5%? This is an interesting question. What is the reasoning for a 10% buffer(like why not 5% or 15%)?. Two scenarios pop into my head. a.) Lets say you have 10 commodities and each are 9% above their optimal weights. That would leave you 90% more exposed to commodities than your model would call for. Obviously your willing to accept this risk(unless you have some other limits in place). Or say all the 10 commodities have optimal weights of -5% and your current position in all commodities is 4%. You should be -50% short commodities but instead your 40% long commodities. b.) With the 10% buffer there is room for path dependency. Taking the example above, if you establish positions in 10 commodities in January and the signals give them 4% weights each and say commodities dont move around much for, say 3-months, you end up being long 40% commodities for those three months. On the other hand, say you establish positions in February and the signals for all commodities is -5% and don't move around a lot for 3 months. You are now -50% short for a few months(2 overlapping with the January scenario). Certainly you can say well they didn't move much so overall the difference might not be that important. But in real time, say in March, we obviously don't know the next few months will be less volatile we just know we're either 40% long commodities or -50% short commodities. These are just a few thoughts. Obviously you can mitigate some of the problem by setting exposure limits and such. But the path dependency scenario would still be there(especially with larger buffers). Obviously I'm biased towards a smaller buffer. By how much I'm not sure that's why I'd love to get your thoughts on the matter! Or say you have 11 strategies equally weighted trading one market. Presumably each strategy is profitable after some conservative measure of costs without any buffering. If 10 of the strategies show now changes in weights and 1 strategy is now 100% long(9% increase in position) you'd be ignoring that valuable signal. Theoretically the optimal buffer size depends only on costs. Higher costs means a larger buffer. Lower costs means a smaller buffer. I use a constant buffer size purely to make life simpler. Did you estimate the buffer purely on a backtest? eg tried a bunch of different buffers for a give set of costs and settled on 10%? Also I apologize I should have referenced your book first. I wasn't fully aware that you calculate the buffer using actual contracts, not percents as I thought. The example in your book is: the upper buffer is 133.52 * 1.1 = 147 contracts. Using this logic then, if I have 1 contract, the upper buffer is 1.1 contracts. So if my optimal number of contracts goes above 1.1(or 1.5 pretty much) then I make a trade. So if my optimal number is 1.6 I just trade one contract? Also, in the example I just gave, isnt the impact different for contracts of varying values. So 1 more contract in JGB is $1m vs 1 more contract in TYA being $125k? I find this aspect interesting, greatly appreciate your thoughts. "Did you estimate the buffer purely on a backtest? eg tried a bunch of different buffers for a give set of costs and settled on 10%?" In fact there are well known analytical methods for deriving the optimal buffer size (we should always avoid fitting when we can), and 10% is a pretty conservative value which I chose to avoid the complexity of including yet another table in my book (it's what I use in my own system, regardless of cost, so this is a simplification I'm personally fine with). "Using this logic then, if I have 1 contract, the upper buffer is 1.1 contracts. So if my optimal number of contracts goes above 1.1(or 1.5 pretty much) then I make a trade. So if my optimal number is 1.6 I just trade one contract?" "Also, in the example I just gave, isnt the impact different for contracts of varying values. So 1 more contract in JGB is $1m vs 1 more contract in TYA being $125k?" Yes, but (a) it's contract risk that is important not notional size, and (b) there clearly isn't anything we can do about this! Gotcha. It still appears more right to me to set the buffer around % allocations(as opposed to contracts). So obviously I'm missing something. I don't want to exhaust you so thank you for your response! Any resources you may have or know of on the subject would be greatly appreciated though!! 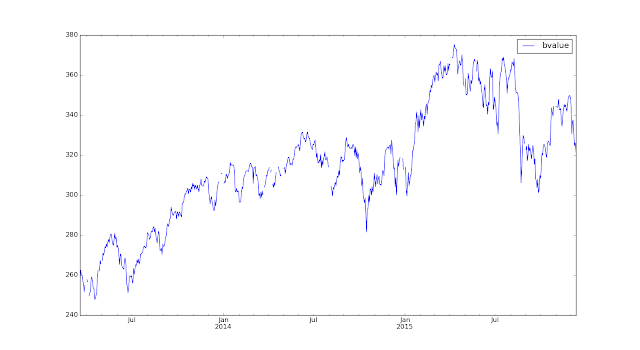 If you don't mind me asking, are your log-scale equity curve charts in base 'e' or base 10? Neither. They are cumulated % curves. So "5" implies I've made 500% return on capital if I hadn't done any compounding. A log curve of compounded returns would look the same but have some different scale. Also, from what I have read, it seems your instrument and rule weights are only updated each time a new instrument enters your system, so you hardcode these weights in your own config; however, these weights do incrementally change each day as you apply a smooth to them. How can one set this up in pysystemtrade? I understand how you hardcode the weights in the config, but how do I apply a smooth to them in pysystemtrade? Or is this done automatically if I included e.g., 'instrument_weight_estimate: ewma_span: 125' in the config? At the moment the code doesn't support this. However I think it makes sense to smooth "fixed" weights as instruments drift in and out, so I'll include it in the next release. Now added to the latest release. Parameter is renamed instrument_weight_ewma_span: 125 (and same for forecasts). Will apply to both fixed and estimated weights. Set to 1 to turn off. Can you provide some further details on how to use fixed weights (that I have estimated), yet apply a smooth to them? I've been unable to use 'instrument_weight_ewma_span' to filfill this purpose... Thanks! I’ve not been clear. I understand how EWMA works and the process of smoothing. 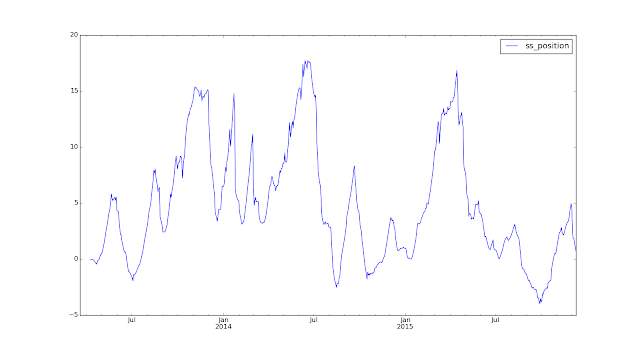 The problem I am having is that I am using weekly bootstrapping to estimate instrument weights. However, each day when I run pysystemtrade the calculated instrument weights can vary significantly day to day due to the nature of bootstrapping. This leads to situations where e.g., pysystemtrade would have generated a trade yesterday when I was running it (which I would have executed), but when I run it today the instrument weight estimates may have changed enough due to the bootstrapping so that the trade that was generated and executed yesterday does not show up as a trade that was generated yesterday today. This makes me less trusting of the backtested performance, as the majority of trades that were historically generated but excluded after resampling are losing trades. I only sample the market once a day generally (so that repeated sampling of the market overwriting the current day’s mark is not an issue). I would like to use the bootstrapping to estimate the weights ANNUALLY and apply the smooth to adjust between last year’s calculated weight, and today’s. But if I am using fixed weights (after having estimated via bootstrapping) by setting them as fixed in the config, there are no longer two data points to smooth between as I have only one fixed estimate in the config. How can I insert an historical weight for last year and a new fixed weight this year (by fixing it in the config) and smooth between them? "I am using weekly bootstrapping to estimate instrument weights...." I think this is a little... well if I'm being honest I think its insane. Okay so to answer the question for backtesting I use one config, and then for my live trading system I use another config which has fixed weights. Personally I run these seperately for different reasons, the backtest to get an idea of historical performance, the 'as live' backtest with fixed weights to compare against what I'm currently doing and for actual trading. There is no configurable way of mixing these, so you'd need to write some code that takes the estimate bootstrapped weights and then replaces them with fixed weights after a certain date. "Also the default is to use weekly returns for optimisation. This has two advantages; firstly it's faster. Secondly correlations of daily returns tend to be unrealistically low (because for example of different market closes when working across instruments)." Why would the default for forecast weights be weekly but not for instrument weights? Oh sorry I misunderstood. You are using WEEKLY RETURNS to estimate instrument weights: that's fine. I thought you were actually redoing the bootstrapping every week. If I wanted to apply a trading rule to one instrument, say ewmac8_32 just to Corn, and another trading rule to another instrument, say ewmac32_128 just to US10, and combine them into a portfolio so that I could get the account statistics, how could I do that? The typical method of creating systems obviously applies each trading rule to each market. I suspect that this would have to be done at the TradingRule stage such that a TradingRule (consisting of the rule, data, and other_args) would be constructed for the 2 cases above. However, I'm having trouble passing the correct "list" of data to the TradingRule object. And, if that is possible, what would need to be passed in for the "data" at the System level i.e. my_system=System([my_rules], data)? I suspect that if all this is possible, it could also be done with a YAML file correct? Thank you so much for any advice and pointing me in the right direction! Easy. The trading rule object should contain all rules you plan to use. Thank you, will test this out! I guess I solved the problem. The issue was the DEFAULT_DATES was set up to December 2015, while data in legacycsv was up to May 2016. So the fx_rate USD-USD wasn't defined after December 2015 causing all the problems. Thank you for the fast response, I'm still getting familiar with GitHub. Did I have to configure somethings through YAML as well as Python code? It seemed like the code above was enough. Maybe you have changed the config, because when I ran the lines you suggested I got the right answer (subtly different perhaps because of randomised bootstrapping, and because I've introduced costs). Try refreshing to the latest version and make sure there are no conflicts. I get 0.89 for E$-US10 correlation, Table 46 in Systematic Trading says 0.35. I understand ST table combines existing numbers for that number, but the difference seems too big. Maybe I did something wrong in the code? I take PNL results for each instrument, and feed it all to CorrelationEstimator. I only left two instruments, EDOLLAR and US10, included two EWMACs and one carry, with equal weights on each instrument. I get 0.87 for correlation. Yes 0.35 is for an average across all asset classes. It's arguable wehter STIR and bonds are different asset classes; which is why I grouped them together in the handcrafted example in chapter 15. 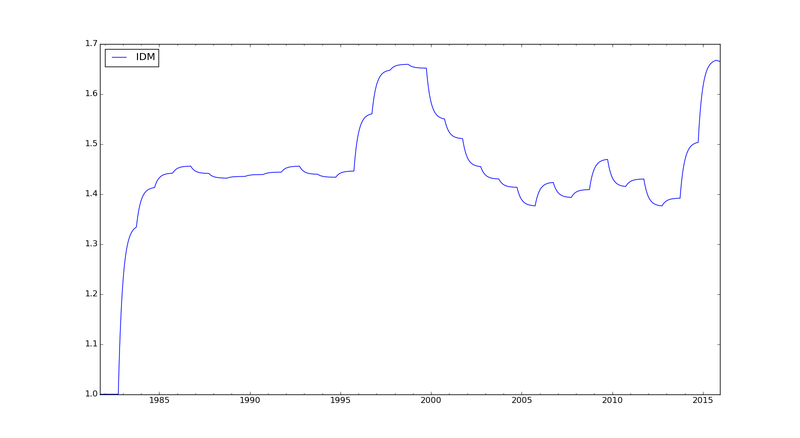 Clearly you'd expect the US 10 year rate and Eurodollar futures to be closely correlated. Thanks! Yes I had the feeling hese two instruments were closely correlated, just was not sure if my calculation was off somehow. Great. And since, according to ST, E$ and US10 are from different geographies that is a form of diversification, and the Ch 15 portfolio has positive SR, so we're fine. where can I find information on how to calculate account curves for trading rule variations from raw forecasts? Do I assume I use my whole trading capital for my cash volatility target to calculate position size and then return, or should i pick certin % volatility target assuming ("guessing") in advanve a certain sharp ratio i'm planing to achieve on my portfolio? 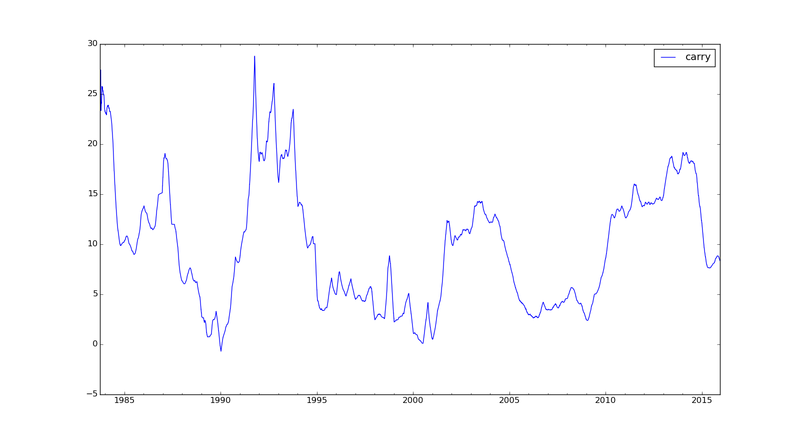 The code assumes we use some abstract notional capital and volatility target (you can change these defaults). Or if you use weighted curves https://github.com/robcarver17/pysystemtrade/blob/master/docs/userguide.md#weighted-and-unweighted-account-curve-groups it will give you the p&l as a proportion of your total capital. 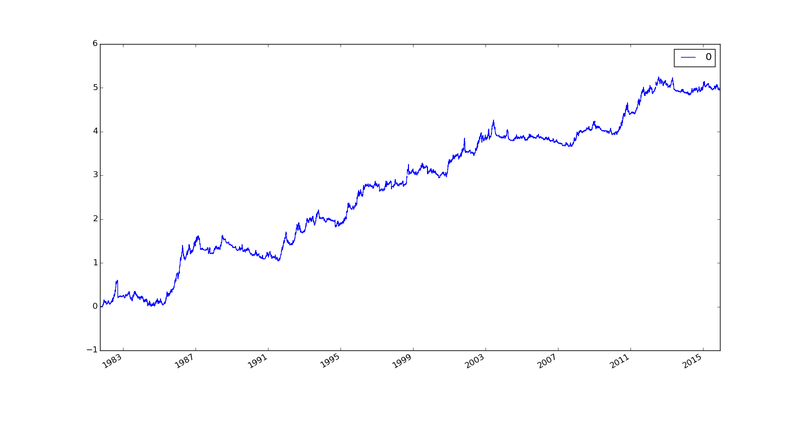 - you point out in your user guide that "it will look close to but not exactly like a portfolio account curve because of the non linear effects of combined forecast capping, and position buffering or inertia, and rounding"
- is the output of pandl_for_all_trading_rules().curve() in fact the percentage of notional capital or do I have that wrong? I appreciate any insights you can give here. Can you send me a private mail? I'm searching for the historical data on the websites you mentioned in the book. I'm looking to the six instruments you also use in this post. On Quandl I can find continuous contracts but this use rollover method at contract expiry and there is no price adjustment. I'm wondering if this is good enough to backtesting because the effective rolling is total different then the (free) data from Quandl. Also with the premium subscription there are a limited methods for rolling. 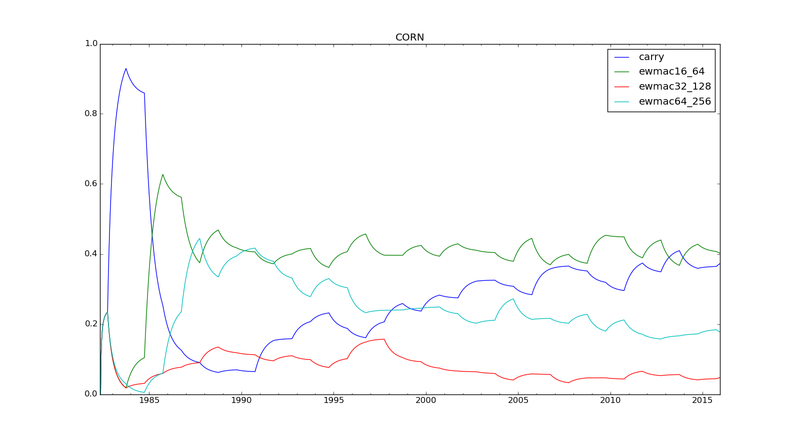 For example : if we roll corn futures in the summer and working only on december contracts, I think this is not possible with quandl (and I think also other data providers like CSIData.com). I'm thinking to write my own rolling methods myself. Is this a good idea and is it necessary to do this (=time consuming). How do you handle this problem ? What do you do with the gaps: fill it by the previous day values to have a value for each day so all dataseries are in sync ? Or skip the line with the result that the dataseries are not in sync ? If I'm calculating rolldown which is PRICE - CARRY I first work it out for each day, so I'll have occasional Nans. I then forward fill the values, although not too early as I use the value of the forecast to work out standard deviations for scaling purposes, and premature forward filling will reduce the standard deviation. OK, that's also the way I do. Calculate the forecasts on the raw data (so with gaps). Afterwards fill it to bring all instruments in sync so it's much easier to calculate PL. An other question about the legacycsv files from github : when I look for example V2X, I see the latest prices not exactly match with the individual contracts from Quandl. Am I missing something ? 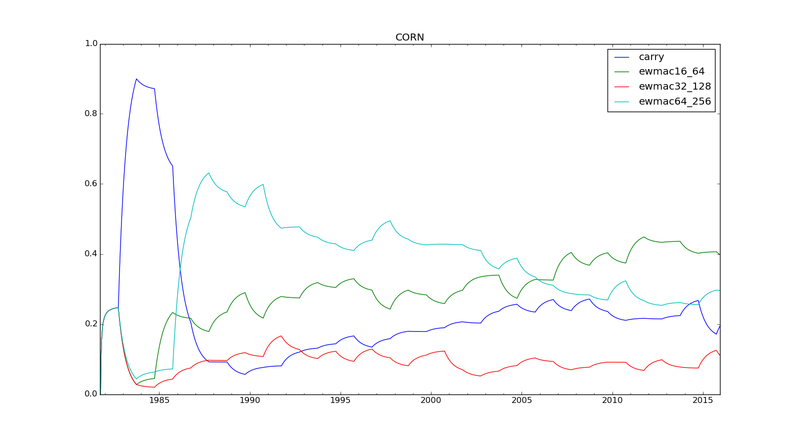 Also checked this for Corn and this has also a small deviation. I suppose you use backwards panama ? What's the reason for this small deviations ? The data from about 2.5 years ago isn't from quandl, but from interactive brokers. Hi, Rob! I'm struggling with forecast correlation estimates used for fdm calculation, could you plz explain what is ew_lookback parameter and how exactly you calculate ewma correlations? E.g. With pooled weekly returns i use first ew_lookback = 250 data points to calculate ewma correlations, then expand my window to 500 data points and calculate correlations on this new set using 500 ewma e.t.c? Why use 250 and not t 52 if use weekly returns? These are the defaults: frequency: "W"
An expanding window means all data will be used. Yes the ew_lookback of 500 implies a half life of ~10 years on the exponential weighting. If you think that is too long then of course reduce it. Personally I don't see why correlations should change that much and I'd rather have a longer estimate. So ew_lookback just specifies my decay factor which i then use for all the data points? How do i go about pooling? e.g. I have asset1 with history from 2010 to 2016 (10 trading rules and variations returns) and asset2 from 2008 to 2016 (10 trading rules and variations returns), do i just stack forecast returns to get total of 14 years of data and calculate correlations 10 x 10 on all of the data or what? Yes pooled returns are stacked returns https://github.com/robcarver17/pysystemtrade/blob/master/syscore/pdutils.py df_from_list is the critical function. Hello, after looking through the python code, I wonder how you came up with the adj_factor for costs when estimating forecast weights? via simulation? THANKS! Please tell me which file you are looking at and the line number please. Chapter 4 of my book. 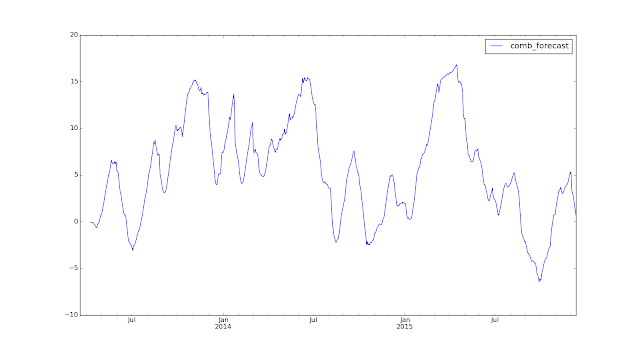 Would you consider making the ewma_span period for smoothing your forecast weights a variable instead of fixed value, perhaps by some additional logic to detect different volatility 'regimes' that are seen in the market? Or maybe such a notion is fair, but this is the wrong place to apply it, and should be applied at the individual instrument level or in strategy scripts? No this smacks of overfitting. Put such evil thoughts out of your head. The point of the smooth is to reduce turnover on the first of january each year, not to make money. (goes to the blackboard to write "I will not overfit" 50 times)...sorry, I've read your statements on overfitting more than once, but had a lapse in memory when this question popped into my thick skull. Thanks for your response. For the diversification multiplier you mention to use exponential weighting. Where or how you implement this? On the returns or on the deviations of the returns from the expected returns (so just before the calculation of the covariances)? Or maybe at an other place ? No, on the actual multiplier. 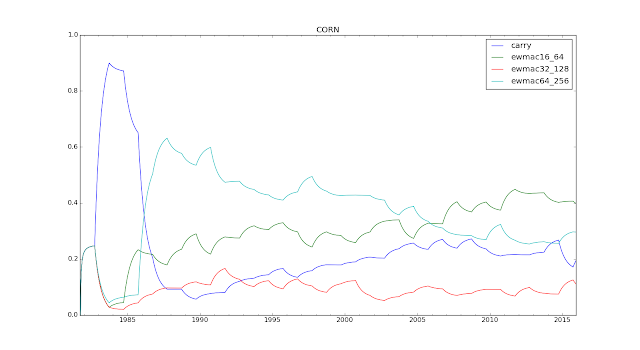 It's calculated from correlations, updated annually. Without a smooth it would be jumpy on the 1st January each year. 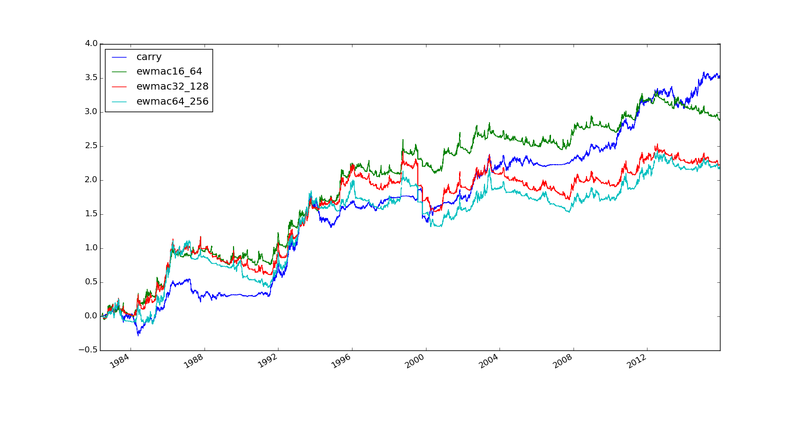 - under 'Forecast Diversification Multiplier' --> 'correlation' : I found "using_exponent: True # use an exponentially weighted correlation, or all the values equally"
- under 'Forecast Diversification Multiplier' --> 'Smoothing again' : I found "ewma_span: 125 ## smooth to apply"
I am a little bit confused about the 2 parameters. 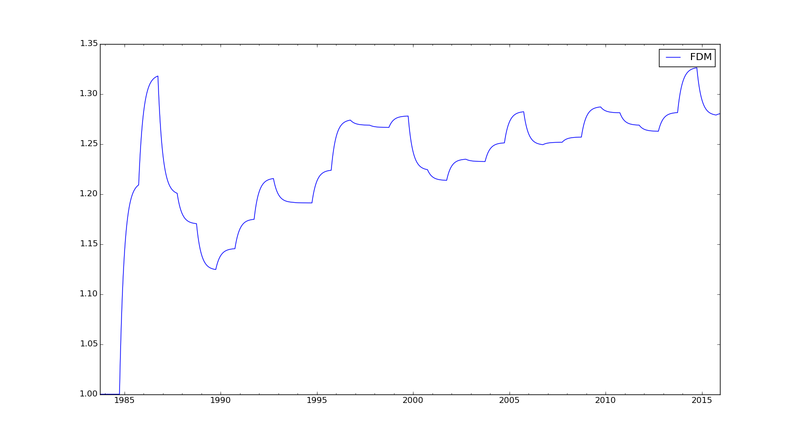 I understand that the second parameter (smoothing again) is to smooth the jump on the 1st January each year. But what about the first parameter (correlation) ? 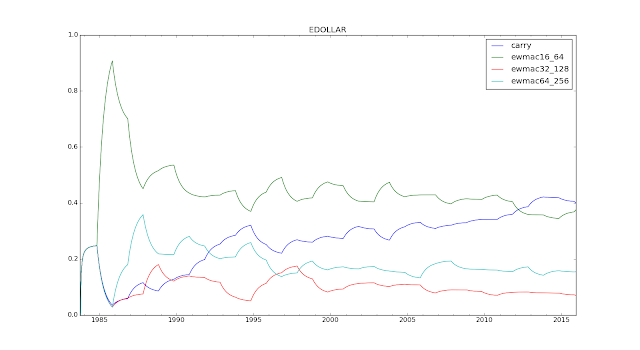 I thought that you use some kind of exponantial weighting for calculating the correlations, but maybe I'm wrong ? Sorry, but it is not so clear for me. I always try to write my own code (don't like dependency of others code) and also I don't see how I can use the pandas libraries into vb.net. I see that the ewm.corr-function return a list of correlations for each date and not a correlation matrix. For the classic corr-function the result a matrix of correlation coëfficients. In your code (https://github.com/robcarver17/pysystemtrade/blob/ba7fe7782837b0df0dea83631da19d98a1d8c84f/syscore/correlations.py#L173) I see you only takes the latest value for each year of the ewm.corr function. I should expect that we must take a kind of average of all correlation values from a pair to calculate the correlation coëfficient for each pair. Can you clarify this, thanks. 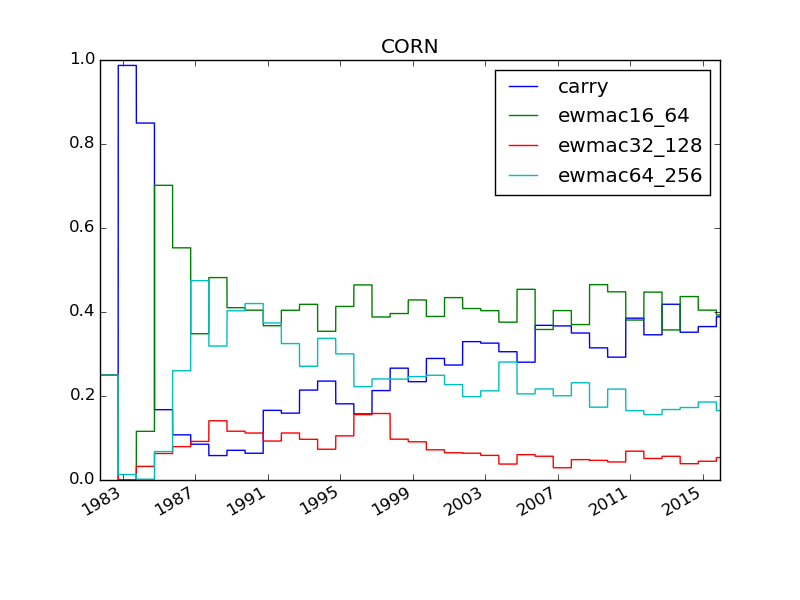 ewm.corr returns rolling correlations; each element in the list is already an exponentially weighted average of correlations. Since I'm doing the rolling through time process myself I only need the last of these elements. OK, but in your simulations you work with an expanding window and do calculations yearly based on weekly data. If we use EWM-span of 125 it means the rolling correlations go back roughly about 3 years (125*5 days). So if for example the total period is from 1990-2016, is the last element of last calculation (1990-2016) then a correct estimate of the correlation of the whole period, because data before 2012 is 'ignored' ? Maybe it's then faster to work with a rolling out-of-sample frame to do this calculations ? Or is my idea on this not correct ? 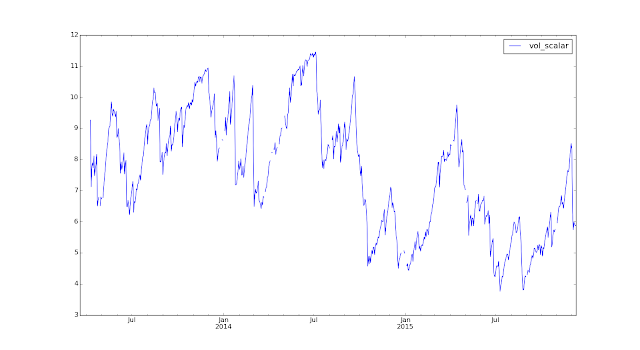 Well 92% of the weight on the correlations will be coming from the last 3 years. So yes you could speed this up by using a rolling out of sample although the results will be slightly different. 5 years would be better as this gets you up to 99%. Rob, in your legacy.csv modules, some specific futures have the "price contract" as the "front month"(closest contract) like Bund, US20 & US10, etc. meanwhile, others such as Wheat, , gas, crude, etc have the "carry contract" as the front month. is this by design? Yes. You should use a nearer month for carry if you can, and trade further out, but this isn't possible in bonds, equities or FX. See appendix B. Thank you so much for your book. It it very educative. 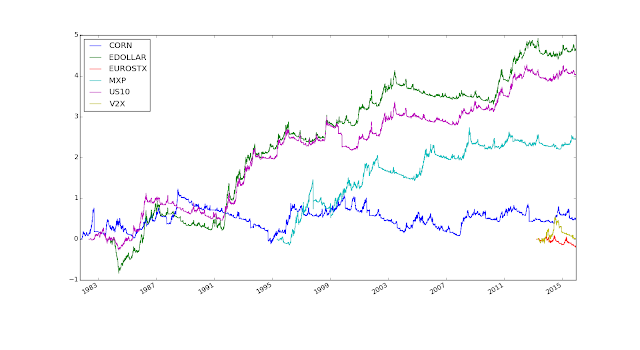 I was trying to understand more about trading rules correlations in "Chapter 8: Combined Forecasts". You mentioned that back-testing the performance of trading rules to get correlation. Could you share a bit more insights on how you get the performance of trading rules, please? (1) Do you set buy/sell threshold at +/- 10? meaning that no position held when signal is [-10,10], only 1 position held when signal is [10,20] and [-20,-10] and 2 positions held when signal is at -20/+20? (3) You entry a buy trade, say at signal=10. When do you signal to exit the trade? when signal<10 or signal=0? or you use dynamic positions, meaning the position varies with signal all the time. (1) f is rules' sharpe ratio calculated using the rules' historical performance pooled from all instruments or just the sharpe of the rule from the instrument we look at? (2) how do you define lemada? =0.0001? if so, is it always 0.0001? Sorry if those two questions had been asked before. To get the performance of a trading rule you run through the position sizing method in the book allocating 100% to a given trading rule. 1) No, that isn't how the system works at all. Read the rest of the book before asking any more questions. 3) No, I use continous positions. You need to read chapter 7 again as you don't seem to have quite got the gist. I don't think I've ever used this formula in my book, or on my blog, so I can't really explain it. If you're using daily closing prices to calculate returns across different markets then nonsynchrous is clearly an issue. BUT NEVER, EVER, EVERY USE ROLLING RETURNS!!!!! They will result in your volatility estimate being understated. Instead use non overlapping 3 day returns eg P_3 - P_0, P_6 - P_3, P_9 - P_6 where P_t is the price on day t.
As for wether 3 days is enough, well even 2 days would help a bit with nonsynchrous data, although 3 days is better, and 5 days (which is what I use, eg weekly returns if you're in business day space) is better still. On a system trading at the kind of speed I trade at using 60 days worth of correlations probably is too short a period, since it isn't long enough to give you a stable estimate. It's also only 20 observations if you're using 3 day non overlapping returns (it's even worse for weekly returns of course, only 12 observations). Your estimate will be very noisy. Thank you! The idea actually came from the Betting Against Beta paper by the guys at AQR. They say they use overlapping(or rolling) 3-day log returns to calculate correlations to control for non-synchronous trading over 120 trading days. I think it is safe to say your disagreeing with their approach? The guys at AQR know what they are doing and almost without exception are smarter than me. So it would be surprising if they'd done something crazy. Using overlapping returns is generally frowned upon (eg in OLS regression, essentially this is a bias versus variance problem). Using overlapping returns artifically increases the data you have (you only really have completely new observations every 3 days) and that benefit must come at a cost. For correlations it *might* be okay; I rarely work overlapping returns so I don't know their properties well enough to say whether they are fine or not. My intuition and a few minutes of playing with excel suggests they will be fine with zero autocorrelation, but maybe not if autocorrelation comes in. But I don't see the point in using two types of returns - one to calculate vol, one to calculate correlation (in most software you work out a single covariance matrix which embodies both things). Yes, I agree. That was also my initial intuition as well. I compared the weekly non-overlapping approach with the overlapping 3-day approach over the same time-frame and the markets that are synchronous the correlation estimates are very similar. More importantly, for example when I ran it on the Hang Seng the rolling 3-day approach was quite close to the weekly approach. So obviously some slight differences but, as you say, the approach doesn't seem like something crazy. Hi Rob, what is your view on using returns (weekly in your case) to compute correlations vs log returns (as per this AQR paper). Why do you suppose some choose log returns, do you view any significant difference between the two? I found this http://papers.ssrn.com/sol3/papers.cfm?abstract_id=1586656 on the topic, but still not seeing the fundamental reason to use one vs the other. Appreciate your thoughts as always. To be honest I haven't given this much thought. 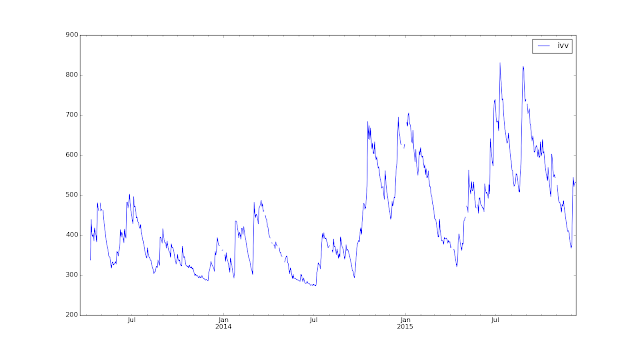 I can see why it will affect the calculation of volatility, but it's not obvious to me how it affects correlation. When I run your ch_15 system along with default configs, trading rules, etc. unmodified, the stages run fine. If I substitute the legacyCSV files of several instruments with *intraday* 1-minute bars in the same 2-column format, both for the '_price' file and '_carrydata' (expiration months spaced from current date like you showed in legacy versions), spanning 5 days each, and re-running the system but changing nothing except reduction of the instrument_list entries, I get the error from line 530 (get_notional_position) of /systems/portfolio.py "No rules are cheap enough for CRUDE_W with threshold of 1.300 SR units! Raise threshold (...), add rules, or drop instrument." I raised it from the original 0.13 to 1.3, and in other tests as high as 100 (ridiculous value of course, just testing...), same result. Seems I'm overlooking a simple principle of the system, but I can't figure why, given the trading rules were left same. Can you offer a pointer? The answer to your question(s) is that I have not tested the system with non daily data so there is no guarantee it will work. I am pretty sure there are several places where I assume the data is daily (and you have unearthed one of them); some data is always resampled daily whilst others are not, so there could be some issues with mismatching and what not. The legacy data with multiple snapshots per day is an oversight (my code should resample to daily before burning the legacy data - that might not have happened on the version of the data you are using) - and indeed it may be causing some slightly unpredictable results in the last few years. In summary I would need to do a lot of testing before I was confident the code would work with non daily data, so I really wouldn't trust it for those purposes yet. 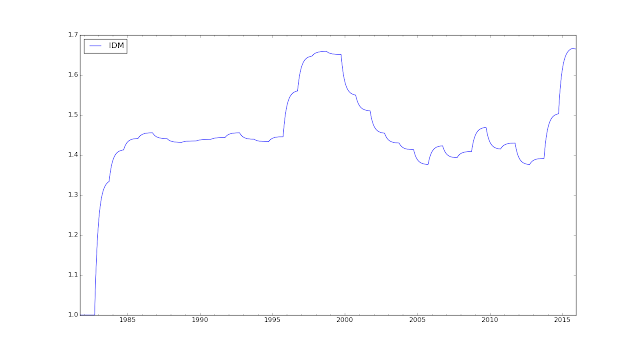 Also, since many of the instruments in the legacy data have a lot of days near the final years of the records with more than one recorded value per day, it seems that using new CSVs with intraday data would be feasible in short order, but making sure to change the period of several calculations in other stages to recognize the periodicity on a minute scale, instead of days, no? P.S. for example, does the diversification multiplier need to be modified for interpreting 1-minute periods instead of sampling at end-of-day? What about volatility scaling floors currently set with daily period? Thank you, Gainz! I see that you have an additional folder in 'sysdata' and the 'price' CSVs are 15-minute entries. Can you comment on the adaptation scheme in the stages of the workflow? For example, looking at the /systems/rawdata.py script, only daily prices are mentioned. Did you go that far with changing the code to recognizing intraday, but left the names as 'daily', or is the actual adaptation still needed? Most of all I always appreciate you for sharing detailed & practical knowledge of quantitative trading. I have a few questions while reading your book & blog posts. I am trying to develop a trend following trading system with ETFs using the framework in your book. The trading system is long-only and constrained by leverage limit(100%). Under the constraints, what is the best way to use your framework properly? Is there any changes in calculating forecast scalars, forecast weights, FDM, IDM, etc? - When I calculate positions for trading, I just assign zero position for negative forecasts. And if sum of long positions exceeds my capital I scale down the positions so that the portfolio could not be leveraged. No change. I calculate forecasts and scale them(-20 ~ + 20). + Calculate portfolio returns of pooled instruments according to the forecasts. + And I scale down the returns for positive forecasts when sum of long positions exceeds my capital. + Returns of trading rules are used when bootstrapping or calculating correlations. + Forecast weights are optimized using these returns. + Calculate FDM based on forecast weights and correlations among the forecasts as your framework. + Calculate the historical participations(= sum(long position)/myCapital) using new rescaled forecasts and forecast weights. + Check the Median(participations) for back-tested period. + If it exceeds 100% I scaled down FDM in order to get my portfolio not take too much risk. Frankly speaking I don't know what the right ways are. Both ways does not seem proper. Maybe it is because of my lack of understading. Would you give any advice? I am really looking forward to your 2nd book. Thanks for reading. Solution 1 is correct. Chapter 14 actually discusses exactly this problem so it might be worth (re) reading it. I have read chapter 14 again and it was helpful. I should have checked the book before I asked. Hi Rob, I have a question with regard to setting up data prior to optimising weights using bootstrapping. If we follow your advice, forecast returns are already standardised across instruments through dividing by say 36-day EWMA vol. However, I understand from the above example, it makes sense also to equalise vols and means. 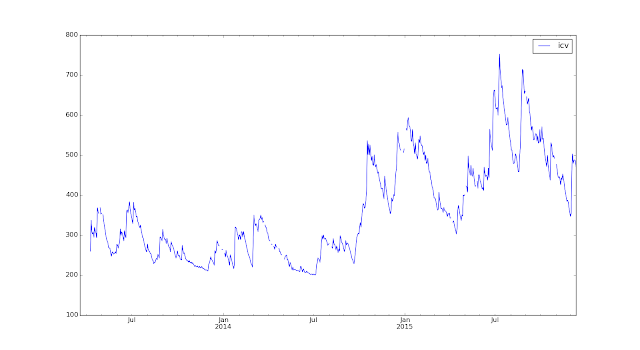 I assume the vol_equaliser fn does this by rescaling the time series of returns so that all the forecast distributions are virtually the same over the entire series (i.e. have identical Sharpes). The weights you derive would presumably be that of a min variance portfolio and therefore relies on a solution based entirely on the correlations between the returns. Is the above correct? I assume you recommend the same procedure for bootstrapping subsystem weights (i.e. equalise means and vol). Now when using pooled data for forecasts, my thinking is fuzzier: is it advisable not to equalise means or vol? You're correct that the solution relies entirely on correlations in this case (in fact it's the optimal Sharpe, maximum return and the minimum variance solution). "Now when using pooled data for forecasts, my thinking is fuzzier: is it advisable not to equalise means or vol?" No, you should still equalise them. Basically the logic in all cases is this. Vol targeting equalises expected vol, but not realised vol which will still be different. If realised vol goes into the optimiser then it will have an effect on the weights, which we don't want. To take an extreme example if you have an instrument with a very short data history which happens to have a very strong forecast in that period then it's estimated vol will be unrealistically high and it will see it's weights downgraded unless we equalise vols. Hi Rob thanks for this. Just so I can get my head around your answer a bit better, a question on terminology: are 'estimated' vol and 'realised' vol the same thing and equal to the vol used for standardisation (i.e. rolling historic 36d EWM vol)? 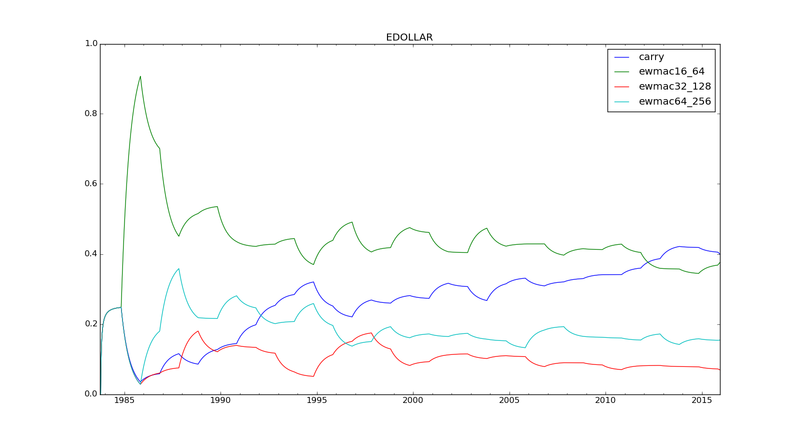 As I understand it the two inputs into the the optimisation you do are correlation and mean returns. So are you saying that if we relied merely on vol standardisation (using recent realised vol) then a period of high vol for an instrument with a short data history but high forecasts would lower the forecasts and their corresponding weights? 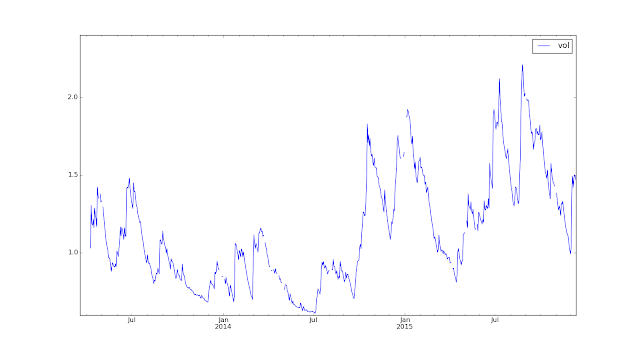 I am failing to make the connection between high forecasts and high price vol which is used for standardisation. I am sorry if I have completely missed the point. On a related point, and I should have asked this earlier: on page 289 of your book you recommend that prior to optimisation we should ensure 'returns have been vol normalised' I assume this is the same as 'equalisation' that you refer to in this post and not the same as standardisation (btw the term volatility normalised is in bold so perhaps your publishers might consider putting a reference in the glossary for future editions before your book becomes compulsory reading for our grandkids). 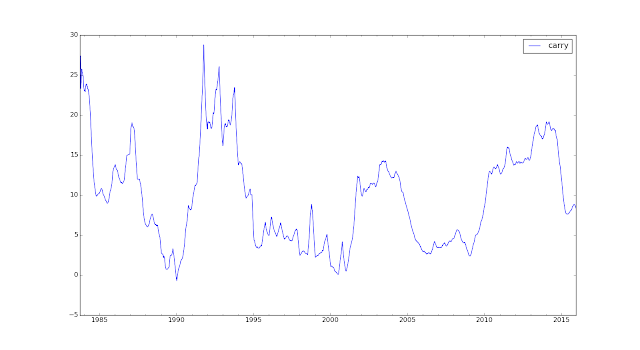 There is rolling historical 36d EWMA vol used for position sizing. Realised vol is what actually happens in the future. When doing optimisation we use a different estimated vol - the vol of returns over a given period (the entire backtest if using an expanding window). The vol used for vol standardisation is the estimated vol of the p&l of the instrument subsystem returns. If all forecasts were identical, and we could predict vol perfectly, then this would automatically be the same for all instruments (because when we scale positions for instrument subsystems we target the same volatility per unit forecast). The fact that estimated vol isn't a perfect forecast adds some randomness to this; a randomness that will be problematic for very short data histories. More problematic again is that for instruments with short histories they will have different forecasts. An instrument with an average forecast of 10 over a year compared to another with an average of 5 will have twice the estimated volatility over that backtest period. But that is an artifact of the different forecast level - it doesn't mean we should actively downweight the higher forecast instrument. c) equalisation of standard deviation estimates when doing optimisation for all the reasons I've discussed. 4. Assuming the above is correct, a subsystem position for carry and EWMAC variation is proportional to exp return/vol^2 (which co-incidentally seems to be proportional to optimal kelly scale - although not for the breakout rule). 5. When I said originally 'Now when using pooled data for forecasts, my thinking is fuzzier: is it advisable not to equalise means or vol? ', to be clearer I was trying to ask whether it makes sense to equalise vols prior to optimising forecast weights when pooling (not whether to equalise vols when optimising subsystem weights, if we had pooled forecasts previously). In a previous post ('a little demonstration of portfolio optmisation') you do an asset vol 'normalisation' which I believe is the same as 'equalisation' discussed here (scale the whole window, although not done on an expanding window) but I got the impression for forecasts that the normalisation is handled as above and this took care of the need for further equalisation (for forecasts at least). I must admit, I had always thought that if you want to use only correlations and means to optimise then intuitively you should equalise vols in the window being sampled (because to quote you this reduces the covar matrix to a correlation matrix). However I had somehow accepted the fact that normalising forecasts by recent vol ended up doing something similar (also from reading some comments by you about not strictly needing to equalise vols for forecasts, etc). But I guess a different issue arises when pooling short histories? In summary, assuming you deciphered my original question correctly, are you saying it is still important to equalise vols of forecast as the 'realised' variance of forecast returns are proportional to the the level of the forecast (so a forecast of 10 would have twice the variance of a forecast of 5), causing the optimiser to downweight elevated forecasts, which is a problem when pooling short data histories? By equalising vols over the entire window being used for optimisation, we end up removing this effect? If that is what you are saying then I promise to go away and think about this much more deeply. OK I think get it. Really had to have a think and run some simulations but as far as I can tell there seem to be two effects in play here. The arithmetic returns from applying a rule on an instrument is the product of two rvs: instrument returns and forecasts. Assuming independence between these rvs, the variance can be shown to be function of their first two moments. Over sufficiently long periods, these moments across different instruments are equal (asymptotically converge). However over shorter periods there may be divergence (i.e. different averages, different vols) which will violate the assumption of equal vols required to be able to run the optimiser using correlations only. As far as I can tell there also is a more subtle effect, and that arises from the fact that forecasts and instrument returns are not independent (EWMAC 2,8 and daily returns when using random gaussian data have a correlation of 45%). This inconveniently introduces covariance terms in the calc for vol. However, in the cross section of a single rule applied across different instruments over sufficiently long periods of time, the covar terms should have an equal effect across all instruments. Again over short periods there may be divergence. This divergence in small samples from the assumed distribution of the population is presumably why it is sensible to equalise vols before optimising. Am I on the right track? BTW please feel free to delete my earlier comment. - in terms of multiple rules; obviously if weights added up to 1 and rules were 100% correlated you'd end up with a joint forecast with exactly the same properties as the individual forecasts. In theory the forecast diversification multiplier deals with this problem; with the caveat that it's backward looking and based on historic correlations so it only works in expectation. Many thanks Rob. The more I dig into your system, the more I appreciate the serious thought which has gone into engineering it. A couple of follow-up observations. From my comparatively low vantage point, I also see that from a practical point of view certain simplifications are desirable (at very little cost to robustness). Would you say that is the case with the FDM? Strictly, if it made a big difference, should we be adjusting for reduced portfolio volatility of forecast returns rather than forecasts themselves? Also, wrt FDMs would you pool all instrument data whether or not they share the same rule variations after costs? Essentially the question is what is the difference between the correlation of forecast RETURNS rather than forecast VALUES. If returns are more correlated than values, the FDM will be too high (producing a trading rule forecast that has too much volatility). And vice versa. In fact the answer isn't obvious and depends very much on the properties of the signal and the underlying market. At the end of the day I think it's more intuitive to state the FDM in terms that it's ensuring the final combined forecast VALUE has the correct scaling properties. FDM would have to be way off for me to drop this point of view. And it usually is pretty close - in fact any effect is dominated by the problem that volatility and correlations aren't stable enough, which means that trying to hit a volatility target is an imprecise science at best. Do you have the breakdown of subsystem signals for the Eurostoxx? You never get short in 2015, only less long? It looks like the market heads down quite a bit. Is this because of the carry signal dwarfing the trend signal? Optically, I can't line up the forecast weights with the chart. Understood. And thank you again, Rob. Hi Rob, do you have any perspective of the (non)usefulness of using a different volatility measure than stddev for Sharpe (e.g. CVaR), consistent with a 95% CVaR as part of a 'Modified Sharpe'? Seems this would have more appeal when one is more concerned about the tails of the non-normal returns, esp with the volatility products like VIX. Depends on what optimiser you are using, but most should allow you to set positive weights as a constraint. If you're assuming same vol and same sharpe ratio then I think (correct me if I am wrong) you will only get negative weights if you have negative correlations, so you could also try flooring these at zero. I did it in Excel by inverting the correlation matrix using MINVERSE. 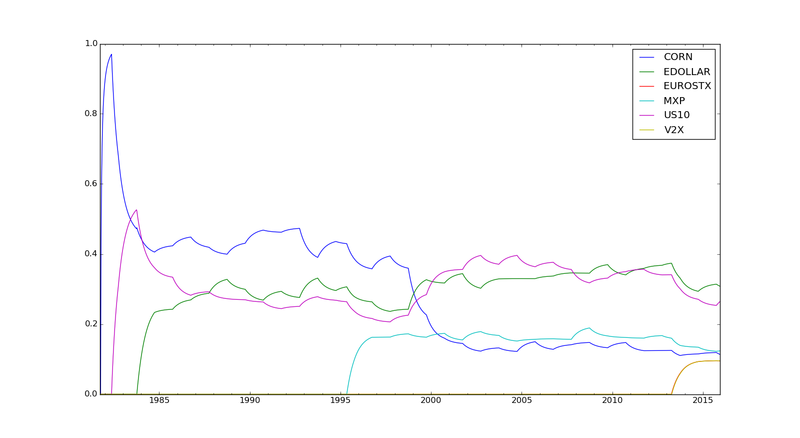 It seems strange, but the correlations were all positive, yet some of the weights were negative. For example, I think with three assets, all with standard deviation of 0.1, and correlations of AvB=0.85, AvC=0.25 and BvC=0.5 I calculate that A & C have positive weights (69% and 57%) and B has a negative weight (-26%). I have the constraint that the sum of weights = 100%, but I haven't worked out yet if I can incorporate minimum weights into the matrix approach. I guess you could try using goal seek instead of MINVERSE but not sure if it works with constraints. Sorry optimisation in excel is a pretty ugly thing that I have always tried to avoid doing.